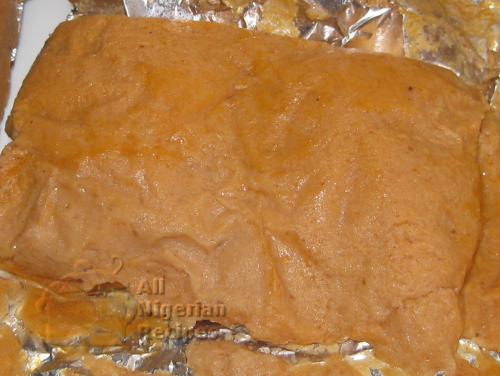 Cooking Nigerian Moi Moi with beans flour can be challenging because during mixing, the dry beans flour does not give a true consistency, unlike when freshly peeled beans is used. Hard boiled eggs: Cut the eggs into small pieces and add after scooping the Moi Moi mix into bowls, uma wraps or aluminium foil bags. Bone Marrow: Cook the bone marrow with onions, thyme, salt and stock cubes till done then add to the Moi Moi while mixing. Nutmeg gives the Moi Moi its classic taste. It is very essential. I used 1.2 litres of water because I love soft Moi Moi. This quantity includes the water used to mix the Moi Moi and that used to mix the dry ingredients. If using bone marrow, the quantity of stock should be part of the 1.2 litres of liquid you will use in mixing the Moi Moi. If after using this quantity and you are not happy with the texture, adjust the quantity of water accordingly but I recommend that you use at least 1 litre of water for the 250g of beans flour else the Moi Moi will be hard. It is best to use cool water when mixing the beans flour. Using the right amount of oil in your Moi Moi ensures that it has a good texture and rolls off the tongue when you eat it but feel free to use any amount of oil you want. And it is advisable to use tastless and odourless oils in Nigerian Moi Moi. Mix the beans flour with 500mls of cool water, making sure there are minimal lumps. You can achieve this by adding a small quantity of water, mix that then add another small quantity. When done, cover and leave to soak for three hours. It is advisable to use one of eggs, bone marrow or corned beef, not the three at the same time. If you will use eggs, cook till hard boiled, cut each egg into about 4 pieces and set aside. If you prefer bone marrow, cook it with big chunks of onion, salt and stock cubes and set aside the stock. If using corned beef, open the can and separate the beef into small lumps. Wash the tatashe pepper (if using it). Remove the tatashe seeds cut the flesh into tiny pieces. Wash the habanero/scotch bonnet peppers, cut into small pieces and set aside. Cut the onions into pieces, grind the crayfish with a dry mill. Crush the stock cubes and set aside. Grind the nutmeg if you bought the nuts. Mix the ground crayfish, ground nutmeg, crushed stock cubes, pepper and tomato puree with a small amount of water and set aside. After 3 hours, pour the mixture of ingredients into the bowl of soaked beans flour. Add the chopped onions and tatashe (if using it). Stir very well to mix. Blend the mixture from 1 above in small batches without adding any more water till you get a smooth Moi Moi batter. When done, pour into a big enough bowl. Set a small amount of water on the stove to boil. Use a big pot. Add the vegetable oil. If using corned beef, add the pieces now. If using bone marrow, add it with the stock at this time. Remember to reduce the total quantity of water you will use for the recipe by the quantity of the bone marrow stock. Cook for at least one and half hours and it should be done. If using bowls, it will take longer. Confirm that it is done by putting a knife through it, if the knife is stained with Moi Moi paste, then the Moi Moi is not done, but if the knife just has a slight smear of Moi Moi, then it's done. Spread the bags out on a tray to cool down to a comfortable temperature.